Ken Rosenthal of Fox Sports said the Phillies were close to trading Jeremy Hellickson for Josh Naylor of the Marlins if another trade went south. The Phillies have made it a habit in recent seasons to acquire veterans with short-term contracts in hopes of trading those veterans at the trade deadline to a potential contender in exchange for a prospect of two. That was the goal when they traded for Jeremy Hellickson from Arizona after the 2015 season. And they would’ve gotten away with it too if it weren’t for those meddling Padres. As you may or may not know, the Marlins and Padres completed a multi-player deal that sent Colin Rea to Miami. San Diego general manager A.J. Preller did not disclose that Rea was injured, which is required whenever two teams engage in a trade. The league suspended Preller 30 days without pay for his actions. According to Ken Rosenthal of Fox Sports, sources told him that the Marlins “wanted to undo their entire seven-player trade with the Padres after Rea suffered a major elbow injury in his first start after arriving from San Diego.” However, the two sides instead worked out a deal instead, with Miami sending back Rea while San Diego returned prospect Luis Castillo. In addition to Miami sending Castillo, they also traded Jarred Cosart, Carter Capps, and Josh Naylor to San Diego in exchange for Rea, Andrew Cashner, and Tayron Guerrero in the original deal. Rosenthal reports that Miami’s “Plan B, if they had nixed the deal, was to trade Naylor to the Phillies for right-hander Jeremy Hellickson and market Castillo for a controllable starter before the Aug. 1 non-waiver deadline.” According to his sources, Philadelphia had agreed to one-for-one swap with Hellickson and Naylor, but lost out when the Marlins decided to keep the trade somewhat intact. The fact that Preller’s antics affected more teams than beyond the ones he traded with “offer additional insight into why some in baseball still believe that Preller’s suspension for 30 days without pay was too light” according to Rosenthal. 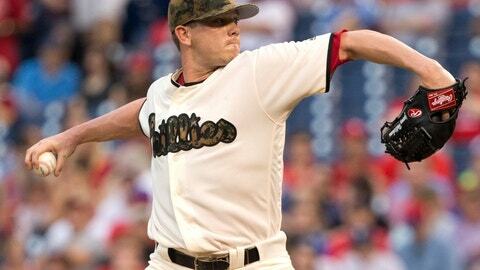 Philadelphia kept Hellickson for the rest of 2016 and retained him when he accepted their qualifying offer. Since the new collective bargaining agreement rules that no player can receive a second qualifying offer, Rosenthal said the Phils “face little choice but to trade him before this year’s non-waiver deadline” if they want to get any return for him. MLB.com ranked Naylor as San Diego’s fourth-best prospect after the trade. The first baseman hit for a collective .264/.302/.407 line between Low-A and High-A in 2016. Naylor has “plus-plus” power according to MLB.com along with a “natural feel for hitting,” both of which helped him become Miami’s first-round pick in 2015. Had Philadelphia been able to acquire Naylor, he would have instantly jumped into the conversation as possibly the team’s best first-base prospect alongside Rhys Hoskins. MLB.com’s overall value of 55 in 2016 for Naylor was the same as Mickey Moniak, Jorge Alfaro, and Nick Williams.